13 Jun National coalitions for digital skills and jobs are launched in Sweden and Greece! The past month saw two new coalitions for digital skills and jobs jobs launched in Sweden and in Greece. 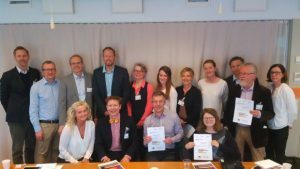 On 3 May 2018 the Swedish National Digital Skills and Jobs Coalition was launched at the IT and Telecom Industries office in Stockholm. The Coalition will work on actions such as developing public sector leadership skills, implementing the national strategy for the digitalization of the school system, raising interest in IT among young people and women, skills uptake and life-long learning as well as immigration and integration and digitalized society available and usable for all citizens. The most important driving force behind the Coalition’s objectives is the Swedish Government’s digital policy strategy, presented in May 2017. The strategy outlines the focus of the Government’s digital policy, in order to contribute to competitiveness, full employment and an economic, social and environmentally sustainable development. The objective is to make Sweden the world leader in harnessing the opportunities of digital transformation. To achieve the overall objective, five goals have been set: digital skills, digital security, digital innovation, digital leadership and digital infrastructure. immigration and integration and digitalized society available and usable for all citizens. 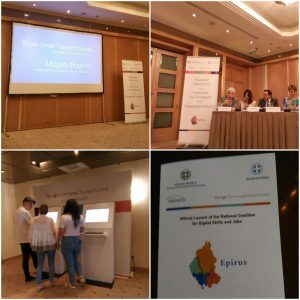 The National Coalition for digital skills and jobs in Greece was launched on 11 June in Ioannina, the capital of the region of Epirus. The event helped showcase the priorities of the Digital skills and Jobs Coalition at a European level, and promote the activities of the digital skills and jobs coalition to end users who can benefit from training to boost skills, and jobs. Ioannina is a region that has been heavily affected by the recession in Greece. The choice to hold the launch there was to testify cooperation with the region and to ensure that activities for the coalition take place all over Greece. The focus of the coalition is to promote and start actions that will have more people in jobs and raise the levels of those jobs through technologies and digital skills: digital skills are a gateway to inclusion. Google Hellas in conjunction with the launch of the National Digital Skills and Jobs Coalition launched an initiative to provide training for SMEs and tourism professionals to bring their businesses online. Over 90,000 professionals in Greece have received free training from google to promote their business and areas online. Over 70% of the professionals have said that the training helped increase their customer base. The Greek Coalition is led by the Greek Ministry of Administrative reconstruction. Members of the coalition range from government partners such as the Ministry of education and digitalisation, private partners such as Google and HePIS, and social partners like the Confederation of Greek Enterprises and craftsmen. Greece is the 20th national coalition launched in the digital skills and jobs coalition. If you want to stay up to date with the news from the Digital Skills and Jobs Coalition, please subscribe to the newsletter. Find out more about the Digital Skills and Jobs Coalition from the website. Become a member here or make a pledge to bridge the Digital Skills gap here. Follow news about the coalition here.